Great gift to customers of Wedding Planners, or for that incredible romantic moment! 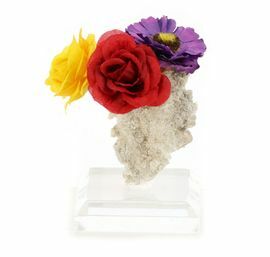 The yellow, red, and purple flowers are always in bloom and the fulgurite lightning sand is a well-known symbol for romance and true love. Fulgurites are naturally created by lightning bolts with temperatures reach as hot as the surface of the sun when they strike a sandy beach or hillside. This is the real fulgurite lightning sand glass, as depicted in Hollywood movies! The exterior of the "vase" is naturally lined with white to grayish sand grains and is beautifully "draped" and has little arms protruding from it. This authentic fulgurite is from Florida and it was naturally shaped like a vase. We thought how cute it would be to put a bouquet of flowers in it since it is shaped like a vase. The bouquet of flowers are fixed in place to the base with high quality resin. Fulgurite Size: 2" H X 1 3/8" W X 1/2" D. The square acrylic base size is an additional: 2" square by 3/8" H and is included. The round walnut base is not included. This authentic "Fulgurite Lightning Sand Vase with Bouquet of Flowers " arrives to you with the clear base, fulgurite, tag, and Certificate of Authenticity. 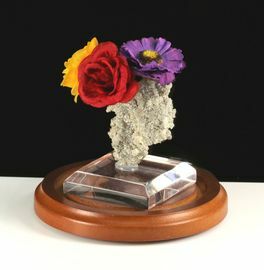 Fulgurites are among the world�s top 5 most unique jewelry gifts. The Lore, Metaphysical and Folk History of Lightning Sand: Promotes Hope, Happiness, Love, Good Luck, Success, Enthusiasm, Serendipity, Insight, Motivation and Creativity. Only one like it! Great as a special gift for a wedding, graduation, birthday, Valentine's Day or anniversary.